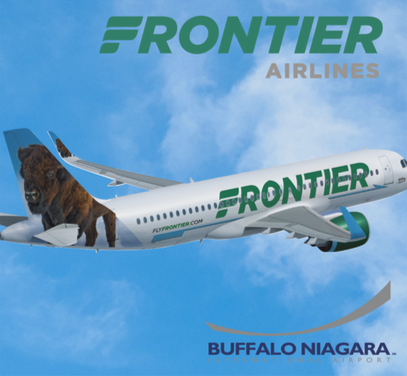 Ultra low-cost airline, Frontier makes its first departure from the Buffalo Niagara Falls International Airport Wednesday, December 6, with a ribbon-cutting planned for 1 PM. Depending on the weather, first-fliers may be treated to a water canon salute from BNIA firefighters. Frontier’s first nonstop flight is to Tampa, but the carrier serves 55 cities. Other nonstop flights from Buffalo will include Fort Myers, Orlando, Miami and Denver starting in April. Frontier is the BNIA’s seventh air carrier and brings the total number of nonstop flights per day to just under 100.